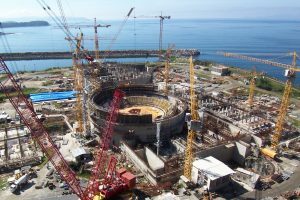 The Brazilian government has restarted discussions about the installation of new nuclear reactors in the country to help relieve the nation’s strained energy supplies. Also Brazil is examining the idea of allowing private companies to help finance the new plans, as has happened with other public infrastructure contracts. The 2007 National Energy Plan had suggested the building of four new nuclear plants, but these plans were shelved following the disaster at Japan’sFukushima nuclear plants in 2011. The government now appears to be convinced that the currently energy mix, highly reliant on hydroelectric plants, will not satisfy growing national power demand. “There is an understanding that a private initiative could take part in some stages of the Brazilian Nuclear Program. Nuclear energy is an alternative that has to be considered,” a source at the Energy Ministry told O Globo newspaper.